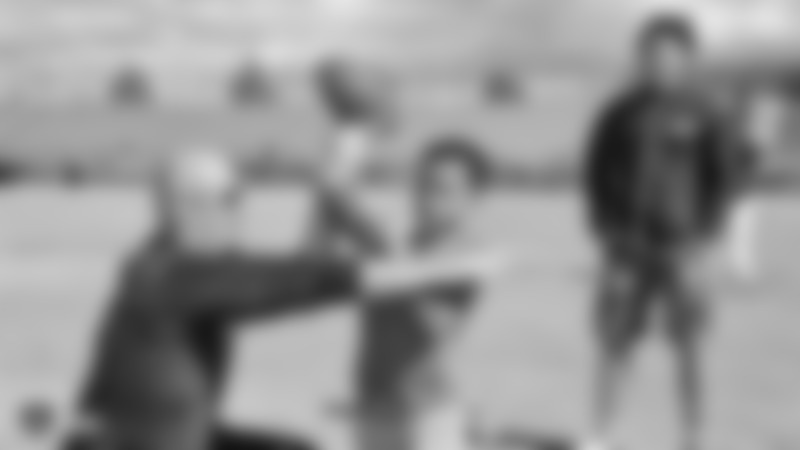 Raiders players unboxed their new, custom cleats for their My Cause, My Cleats game against the Kansas City Chiefs in Week 13. 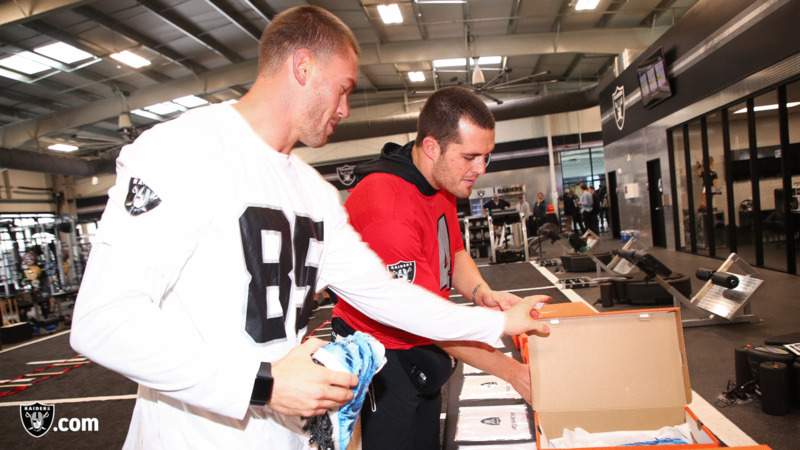 Oakland Raiders tight end Derek Carrier (85) and quarterback Derek Carr (4) unbox their custom cleats for the NFL's My Cause My Cleats campaign at the Oakland Raiders Practice Facility, Wednesday, November 21, 2018, in Alameda, California. Oakland Raiders quarterback Derek Carr (4) unboxes their custom cleats with equipment manager and painter of the cleats, Bobby Romanski, for the NFL's My Cause My Cleats campaign at the Oakland Raiders Practice Facility, Wednesday, November 21, 2018, in Alameda, California. Oakland Raiders guard/center Jon Feliciano (76) unboxes their custom cleats for the NFL's My Cause My Cleats campaign at the Oakland Raiders Practice Facility, Wednesday, November 21, 2018, in Alameda, California. Oakland Raiders center Rodney Hudson (61) unboxes their custom cleats with equipment manager and painter of the cleats, Bobby Romanski, for the NFL's My Cause My Cleats campaign at the Oakland Raiders Practice Facility, Wednesday, November 21, 2018, in Alameda, California. Oakland Raiders quarterback Derek Carr (4) unboxes their custom cleats for the NFL's My Cause My Cleats campaign at the Oakland Raiders Practice Facility, Wednesday, November 21, 2018, in Alameda, California. Oakland Raiders tight end Jared Cook (87) unboxes their custom cleats for the NFL's My Cause My Cleats campaign at the Oakland Raiders Practice Facility, Wednesday, November 21, 2018, in Alameda, California. Oakland Raiders tight end Jared Cook (87) unboxes their custom cleats with equipment manager and painter of the cleats, Bobby Romanski for the NFL's My Cause My Cleats campaign at the Oakland Raiders Practice Facility, Wednesday, November 21, 2018, in Alameda, California. Oakland Raiders running back DeAndrŽ Washington (33) unboxes their custom cleats with equipment manager and painter of the cleats, Bobby Romanski for the NFL's My Cause My Cleats campaign at the Oakland Raiders Practice Facility, Wednesday, November 21, 2018, in Alameda, California. Oakland Raiders linebacker Shilique Calhoun (91) unboxes their custom cleats for the NFL's My Cause My Cleats campaign at the Oakland Raiders Practice Facility, Wednesday, November 21, 2018, in Alameda, California. Oakland Raiders defensive tackle Frostee Rucker (98) unboxes their custom cleats with equipment manager and painter of the cleats, Bobby Romanski for the NFL's My Cause My Cleats campaign at the Oakland Raiders Practice Facility, Wednesday, November 21, 2018, in Alameda, California. Oakland Raiders cornerback Rashaan Melvin (22) unboxes their custom cleats for the NFL's My Cause My Cleats campaign at the Oakland Raiders Practice Facility, Wednesday, November 21, 2018, in Alameda, California. Oakland Raiders cornerback Nick Nelson (23) unboxes their custom cleats for the NFL's My Cause My Cleats campaign at the Oakland Raiders Practice Facility, Wednesday, November 21, 2018, in Alameda, California. Oakland Raiders linebacker Kyle Wilber (58) unboxes their custom cleats for the NFL's My Cause My Cleats campaign at the Oakland Raiders Practice Facility, Wednesday, November 21, 2018, in Alameda, California. Oakland Raiders linebacker Tahir Whitehead (59) unboxes their custom cleats for the NFL's My Cause My Cleats campaign at the Oakland Raiders Practice Facility, Wednesday, November 21, 2018, in Alameda, California. Oakland Raiders defensive tackle Clinton McDonald (97), linebacker Marquel Lee (55), and linebacker Emmanuel Lamur (54) unbox their custom cleats for the NFL's My Cause My Cleats campaign at the Oakland Raiders Practice Facility, Wednesday, November 21, 2018, in Alameda, California. Oakland Raiders linebacker Tahir Whitehead (59), linebacker Shilique Calhoun (91), and linebacker Nicholas Morrow (50) unbox their custom cleats for the NFL's My Cause My Cleats campaign at the Oakland Raiders Practice Facility, Wednesday, November 21, 2018, in Alameda, California. Oakland Raiders safety Erik Harris (25) unboxes their custom cleats with equipment manager and painter of the cleats, Bobby Romanski for the NFL's My Cause My Cleats campaign at the Oakland Raiders Practice Facility, Wednesday, November 21, 2018, in Alameda, California.